Publisher Bandai Namco Games have announced that they will be publishing the latest game based on Reki Kawahara’s Sword Art Online, Sword Art Online: Lost Song, in Europe and North America. The game will be coming this Fall/Autumn for the PlayStation 4 and PlayStation Vita. Additionally, a PS4 port of the previous title, Sword Art Online: Hollow Fragment, will also be released this Summer. Sword Art Online: Lost Song will be released in Europe and North America regions on the PS4 and Vita this Fall/Autumn, both digitally and in retail. A remaster of the Vita title Sword Art Online: Hollow Fragment will also be out on the PlayStation 4 coming this Summer, titled Sword Art Online Re: Hollow Fragment. The game will only be available digitally via the PlayStation Network Store, but will contain all the released DLC that will be unlocked later. Additionally, players who have the save data from the Vita release can transfer it to the PS4 release for additional items. 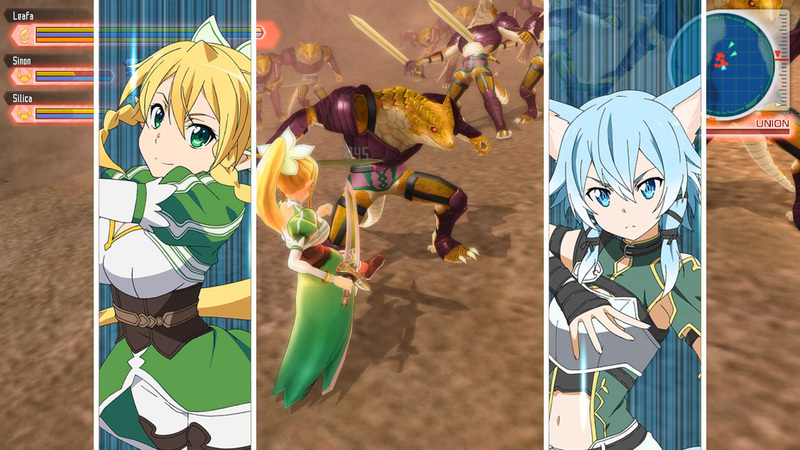 Sword Art Online: Lost Song will be set in the new Alfheim Online after a merge with Sword Art Online and will feature a new original story. Following the merging of both games, a new mysterious floating continent has appeared, Svart ALfheim. The game will be the first in the series to let you play multiple characters, where previous iterations only letting you play as series protagonist Kirito. One new big feature in the game is the introduction of air combat, which is featured the light novel and anime’s counterpart. The game is split up into two combat modes that can be switched at any time in a seamless motion: the ground combat, which features traditional turn based RPG mechanics from previous games but with the inclusion with jumping, and the air combat, which has a new full action and movement system. Sword Art Online is a light novel series written by Reki Kawahara, who also is the author of Accel World, and illustrated by abec. The light novel series began in 2009 and is illustrated being published in ASCII Media Works’ Dengeki Bunko. To date a total of 15 volumes have been compiled in the series, released in Japan on August 9th 2014. . Since then it sold millions of copies, topping the charts in 2012. Additionally in 2012, an anime adaptation was released. The Sword Art Online anime aired in July and was produced by A-1 Pictures, which received a large reception. Since then, the series has appeared on a plethora of media with international merchandise, spinoff manga, and handheld and browser video games, including Sword Art Online: Hollow Fragment for the Vita. The latest manga volume, Sword Art Online: Caliber, began serialization in the September issue of Dengeki G’s Comic magazine. In addition, Kawahara has relaunched the series as Sword Art Online: Progressive, a re-release of the light novels with additional content. A new light novel adaptation titled Sword Art Online: Alternative will begin publication on December 10th. A second anime adaptation of the series began airing from July this year. Sword Art Online: Lost Song will be released in European and North American regions this Fall/Autumn for the PS4 and Vita. Sword Art Online Re: Hollow Fragment will be coming out digitally only this Summer for the PS4. For more information and screenshots on Lost Song visit here.